Hello all! Happy Monday, and Charlena here to tell you about a great experience I had at the Hilton Garden Inn Tampa Southeast. This facility is approximately 14 minutes from downtown Tampa, and is convenient to the I-4 corridor and the Crosstown Express. This three year young property offers many perks such as; complimentary shuttle service to area malls, The Hardrock Casino and cruise ports. Other amenities include evening room service, a full service restaurant and heated pool. In addition to these luxuries you also have access to flexible business space. The Hilton Garden Inn has 4,200 square feet of meeting/banquet space that includes drop down project screens, complimentary wired and wireless internet and A/V equipment rental. There is an additional 3,480 square feet Grand Ballroom which can be configured into four individual meeting rooms with indoor/outdoor function capabilities. Wow! 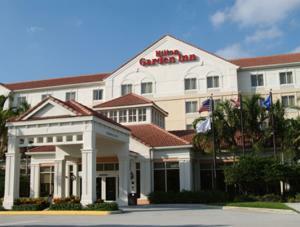 If you are looking to relax and work in one spectacular setting, the Hilton Garden Inn Tampa Southeast is a great choice! That&apos;s all for now, but stay tuned in for more Hotels Tampa Bay related new and information!